You can view and download PDFs of past auctions via the menu on this page. Our professionally produced, fully illustrated printed color catalogs are available by subscription at a cost of only $20 postpaid for a full 12 months. Prices realized reports are posted on our website – printed copies available by sending SASE. 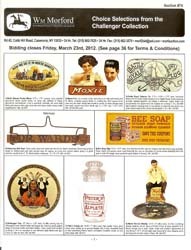 Subscriptions can be ordered instantly via our secure credit card shopping cart located at https://wm-morford-antiques.myshopify.com/products/catalog-subscription or by mailing a check, money order or calling our office with your credit card information. *Notice: We do not accept unsolicited advertising faxes! Professionally produced and fully illustrated printed catalogs featuring high quality photos, detailed item descriptions and conditions for each sale, delivered directly to your door.